Carte de visite (CDV) photo, measuring 2.5 x 4 inches, with a revenue stamp on the back (2 cents, blue with George Washington). Photographer is Reimer of Philadelphia, Pennsylvania. Written in pen on the stamp as a hand-cancellation is B. F. R. Aug 11 1864. I admire her strong countenance and the way it contributes to the overall boldness of the image. The revenue stamp by itself would have narrowed the date to 1864-1866, but we are lucky that the photographer decided to hand-cancel the stamp and include the date. 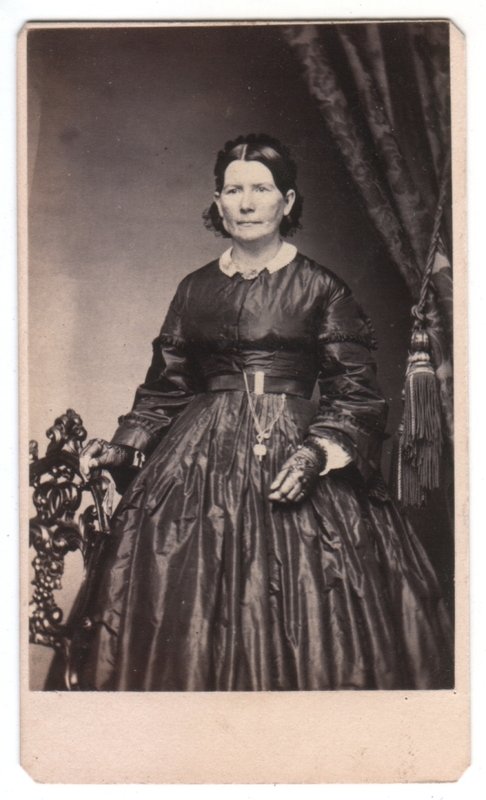 The date would be the day she paid for this copy of her photo, as opposed to the day the photo was taken, though the two events were presumably not too far distant, if not the same day. I admit I’m not sure what the typical turnaround time would have been back then. Even if the photographer was able to provide same-day service, it’s possible that this was a duplicate copy ordered later. And by the way, the 2-cent revenue stamp means that the retail value of this photo was up to 25 cents. Love her little half-gloves. Is that a watching hanging from her belt? Yes, I like the gloves, too. I would have guessed a watch, but hopefully one of our vintage clothing experts can chime in on that. I’m also wondering if this qualifies as mourning dress. That was my initial thought, but the dress seems so shiny, and I think of mourning as being less flashy. I’d be glad for any thoughts on that. She is lovely. I think she was a lady who laughed and smiled frequently. He eyes say she is finding it hard to stay still! This PHILADELPHIA woman was definitely in “Mourning”. She was from a distinguished family. The size of her “hoop” was an indicator of wealth. That is why some doorways had to be large enough for these “ladies of fortune”. Thanks for the info. Funny these days to think of having to construct a doorway around the width of a garment.